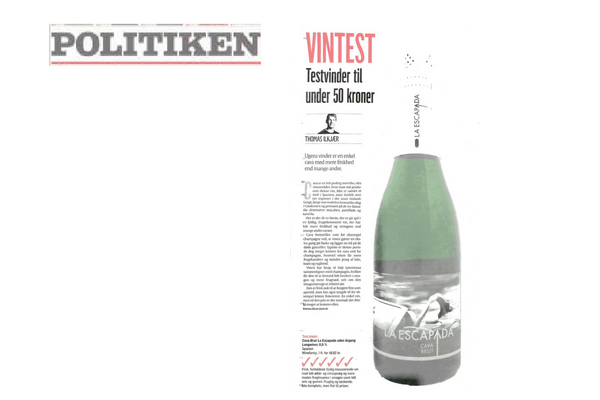 Our wines are proving very popular with the press at the moment – one of our latest cuttings is for La Escapada Cava Brut, this time in Denmark where it was the top scoring wine in a tasting of wines priced under 50 Kröner – around 7€. “Wine of the week” La Escapada Cava Brut was described by wine critic Thomas Ilkjaer of leading newspaper Politiken as having more freshness than many others, along with notes of citrus, and a balanced palate. La Escapada is made for Long Wines on a single estate in the heart of Catalonia’s Cava country. Its name, which means ‘The Escape’, is used in Spain to refer to holidays, weekend breaks and nights in hotels or simply just getting away from it all. We think La Escapada is perfect for little escapes and breaks away and, judging by its success in world markets, other people do too. As well as the Brut version made from local Parellada and Macabeo grapes and aged for 12-15 months in bottle, La Escapada is also available in Demi Brut and Rosé styles.